My husband worked in the automotive industry when the recession hit, and lost his job along with many others. Since then, he has started over in his career and is now in his third year as an electrical apprentice. It’s a great new career for him and once he’s a licensed electrician, we will finally be able to relax and not worry about his professional future. We still have a couple of more years before we get there, so we have had to look for ways to save money so we can get by in the meantime. I started looking for bargains and coupons, and ways to save on groceries. I realized that I can save quite a bit of money by traveling a bit to a less expensive grocery store, and by shopping the sales that I find in the flyers. For clothing, we started visiting a second hand store in a nearby city and we have found some nice clothing there. We do have to make somewhat regular visits to find things, but it’s well worth the trips for the money we save on clothing…and the clothes are often in new condition! Shopping online at kijiji or similar types of buy and sell sites is another way to save some money. Furniture, bicycles, exercise equipment, appliances…any of those larger purchases can often be made second hand for a fraction of the purchase price. The best part is that you can shop right from your computer and check every day to see what is added. When it comes to necessary expenses, like car insurance, I made some calls and found that if I purchased my car and home insurance together I could get a better deal, and when I did that through my bank I was given an even better deal. I saved around $100/month by making those simple changes! You can usually get similar bundle deals for your cable, internet and phone services, and sometimes the cell phone too. Taking advantage of workplace discounts and family plans can also save you money on your cell phone. Being on a budget doesn’t mean you can’t have fun. You need to make your own fun! 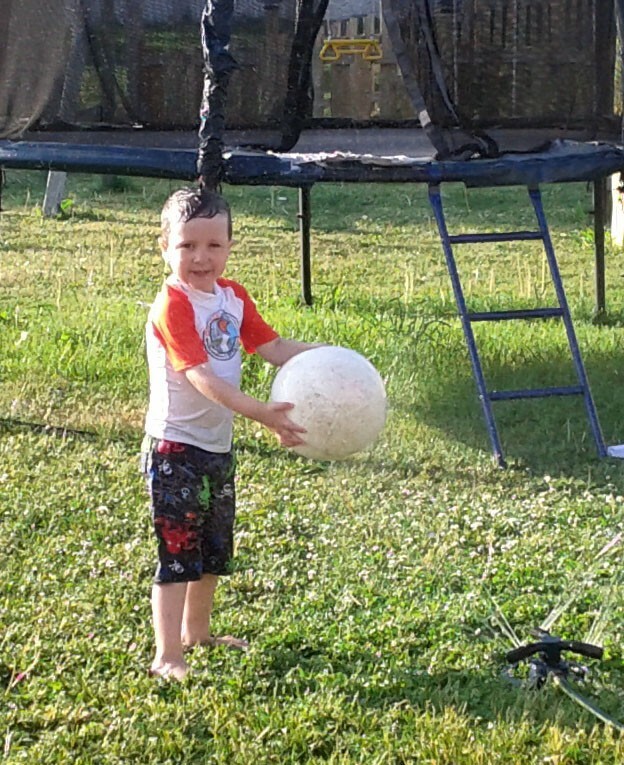 Playing in the backyard sprinkler is one of my kids’ favourite pastimes. We also like to visit the local splash pad that is free, play at the playground, go for walks, watch movies at home and go for bike rides. Fun doesn’t have to be expensive! Most of all, a budget is key. Set realistic limits and be sure to account for the little expenses that you may not be thinking about, like bank fees. If you really understand where your money is going, you have a better chance to staying on track and saving some money for the future. We are definitely on a budget at our house and are always looking for ways to save! Great tips — we use a lot of those ideas; my biggest tips is to wait 30 days before any purchases (other than the obvious groceries, meds, etc); I often find that at the end of that time, what I *thought* I needed, I really don’t! I need to put myself on a stricter budget. My worse offense is the grocery store. Great tips. We live on a strict budget and are saving for a new house. So eating out is a no no and groceries have a budget that I never go over. Or else it would be through the roof. I use coupons and will stock up on products when they are on sale. It also pays to ‘know’ your prices – often a product is significantly more expensive/cheaper at certain stores.. I will only buy it there.. I will also buy in bulk if possible – I can purchase things like spices for WAAAY under a dollar vrs a few dollars prepackaged… and it’s fresher! Great tips! It was hard for us to learn to budget when we were first married, but I’m so glad we stuck to it.